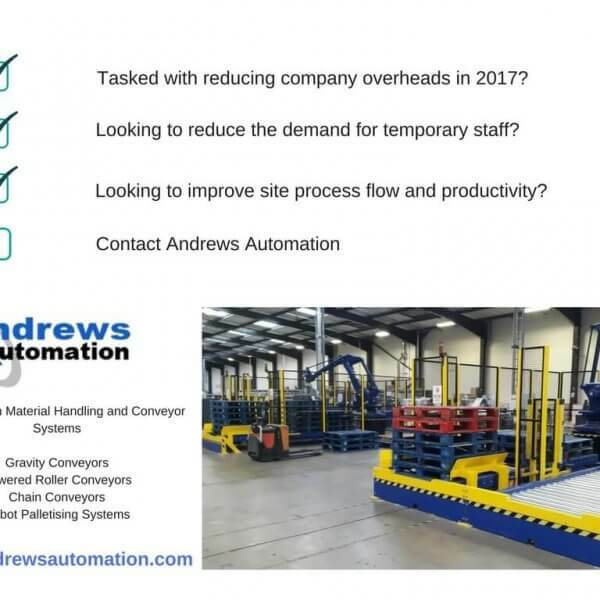 Deniconda is a new, slim line spiral conveyor system available from Andrews Automation. Perhaps you’d like to bridge differences in height cleverly and efficiently. Or integrate an intermediate level, or a buffer in the material flow without completely rebuilding your conveyor. All that’s possible with Deniconda spiral conveyor. Deniconda is slim-line, but still very strong and ideal for various industries, particularly the food segment. The modular belt has a rolling support on the inner radius. The spiral conveyor uses Deniroll curve support. As a result, sliding friction, resistance and energy consumption are all reduced. Consequently, a much smaller drive motor is required. In addition to the drop in energy consumption, wear and tear is also cut and much less maintenance is required. In other words, the investment pays for itself in a very short space of time, an aspect that decreases the total cost of ownership substantially. Modular and can be custom-configured as a result. Available in a number of different dimensions. Easy to integrate into existing conveyors. Lightweight but still very strong. Particularly ideal for the food industry and easy to clean. Requires a much smaller drive motor as a result. Is low on wear and tear and maintenance. Whatever your requirements are, we can built a tailor-made system to your exact requirements. Give us a call today to discuss your project and we can identify the correct solution for you. Tasked with reducing company overheads in 2017?